SAN ANTONIO - There are now 14,000 dockless scooters and bikes with permits in the Alamo City. On Tuesday, the city's Transportation Committee put a temporary cap on the issuance of future permits. "These scooters are just litter, at this point," Josh Cottle said. Cotter, who works in downtown San Antonio, said he is fed up with dockless vehicles. "These companies have simply found a place that's not really regulated, and they want to make a profit as quickly as possible before the regulations kick in. It's extremely exploitive," he said. 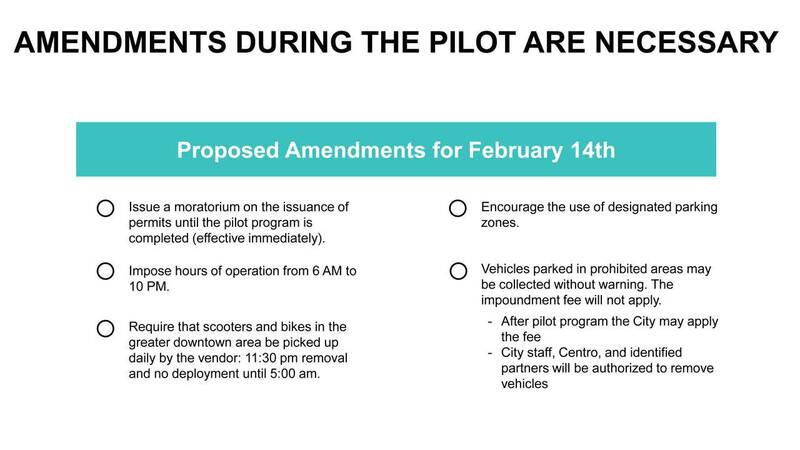 The city's Transportation Committee will not be allowing any more dockless vehicles to come into the city until the six-month pilot program is complete on April 19. At Tuesday's meeting, several things were discussed, such as the number of accidents, violations and impoundments of the scooters. Five proposed amendments were also put in place for a City Council vote on Feb. 14. After the pilot program, which was launched in October, ends, the City Council will gather all collected data, along with responses from a city survey that was released Tuesday on SAspeakup.com. District 8 Councilman Manny Pelaez, who has made it clear he is not a fan of the scooters, said he hasn't heard anything positive from his constituents. He said there is a lot of work that needs to be done. "I'd love for the city to make a request for proposal to partner with one or two companies, limit drastically the number of scooters on the street and make sure we are doing things that help the 38 million tourists that come to San Antonio but (also help) the 1.5 million people that are currently here," Pelaez said. Bird has the most at 4,500. Uber's company, Jump, isn't far behind with 2,000 scooters and 2,000 bikes. 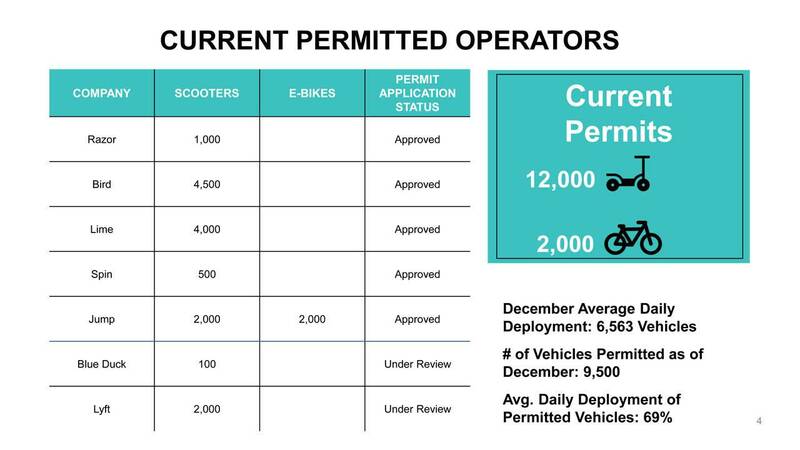 As of December, the city said, there have been 1.2 million rides. How are the rules concerning the bikes and scooters being enforced? The city said parking enforcement has corrected about 15,000 scooters improperly parked on streets or sidewalks as of December. 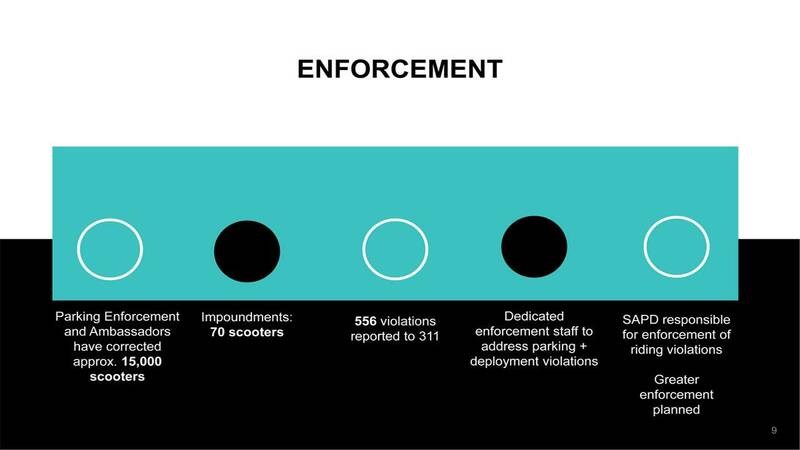 The city said 70 scooters have been impounded, with 556 violations reported to 311. According to the San Antonio Police Department, 78 injuries have resulted from dockless scooters and bikes since they made their way into the city. SAPD has given out 11 citations to riders, saying most of the violations they have given are verbal warnings. John Jacks, director of the Center City Development and Operations Department, said there is still a lot of work to be done. "We are trying to find that balance," Jacks said. "I don't think we should absolutely prohibit them, but we also need to know that we have smart effective regulations, as well." There is also a new way to report any dockless scooters or bikes that are in violation, via the 311 app. The city also wants to hear from residents. It released a survey on saspeakup.com, which will be available until April 19. The City Council will use the information, along with the data gathered through the pilot program, to come up with permanent regulations.